The 5553200 Over-Belt dispensing robot is perfect for applications that require the part to remain stationary as the dispense head moves around it. Intended for use with some conveyor systems, index systems, or for desktop use. For use with PLCs. Interface for IO connections on the control box for external control. 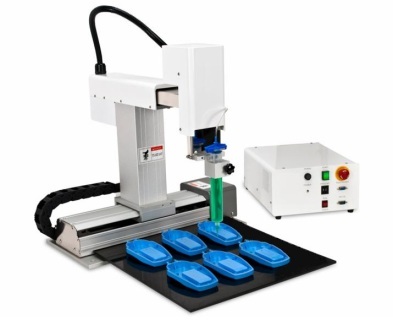 This unit is a great choice when the work area on the standard low cost 200mm desktop robot does not offer enough reach in the Z axis, or when you want to work in conjunction with indexing tables or have the parts fixed during the dispense. This system can be used with different dispense heads as well. The volume you are trying to dispense per deposit, and the total usage in a day or shift helps dictate which type of a dispense head is right for you. Will the Syringe be enough? For many, it is a great place to start and then add on a different dispense head in the future. Please contact IDS at any time to discuss other options. Contact IDS for a quote on these options or at any time with your questions!